Built up on a plinth, and clad in relentless swaths of travertine, Lincoln Center was once considered by many to be a remote acropolis of culture. A half century after it was built, the iconic mid-20th-century performing arts compound is coming down to earth, or at least to the surrounding streets of New York City’s Upper West Side. The podium and stone remain. But a whimsical glass pavilion — the latest phase in the eight-year redevelopment of the 16-acre campus by collaborating firms Diller Scofidio + Renfro (DSR) and FXFOWLE — is engaging theatergoers, tourists, and the neighboring community with a first-rate restaurant, state-of-the-art film center, and a rare patch of urban green on its roof. 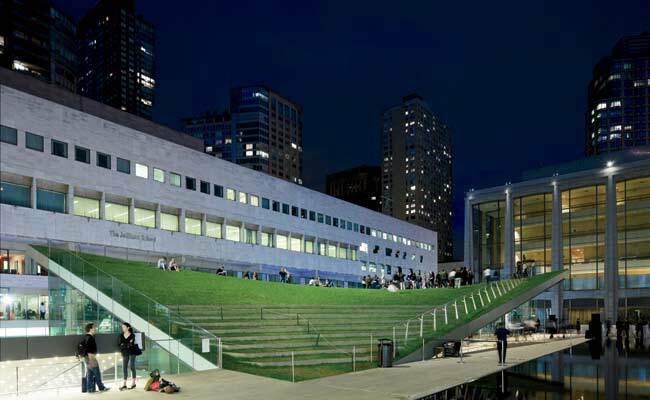 Indeed, this populist intervention in many ways culminates the team’s efforts to revitalize the complex and its intersecting thoroughfare, West Sixty-Fifth Street, a master plan initiative responsible for the previously completed Alice Tully Hall renovation[RECORD, June 2009], and the Juilliard School extension [RECORD, February 2011]. This is largely due to the comprehensive 40,000-square-foot project’s strategic location on the site, as well as the critical programmatic elements the architects were required to incorporate into it: cultural, public, and private. It seems like when you finally get it right in Architecture, Art, Music, Fashion, etc, you become a “sellout.” So what is Right? How can we get it right? Will anyone know the difference? In the music industry, record companies spend millions studying what kind of music we enjoy. Recently I heard that they have developed a formula for what makes great music whether we consciously agree or not (they call it “musically satisfying”). Is it any wonder we get those cheesy songs stuck in our head? This comes as no surprise in a technologically advanced and transformative world. Could the same be true for Architecture (Architecturally satisfying)? Like many other Architects, I subscribe to hard copies and digital copies of various Art & Architecture magazines. It’s fun to see all the new and exciting international projects that have been commissioned. It’s also frustrating to see that many of the projects follow some sort of formula – It is easy/difficult to put a finger on it but given an opportunity – Budget, Client, Program, couldn’t we too fudge, I mean design something similar? I remember an old college professor telling us how in his day he had to study / copy the Masters of his day for Architecture School. I am pretty sure I did not miss class the day they taught the secret formula to creating great Architecture – Which leads me to ask, What is great? I mean, we all have our opinions on the Masters of our day – Good or Bad. What I mean to ask is something that delves deeper. Besides the ability to obtain intellectual clients with extremely high budgets looking for “meaningful” design, how do these high profile Architects / Architecture firms land these clients? Once they figure out this formula is it a matter of fine-tuning it and repeating it? Although Architecture is filled with Order & Rules (figuratively and literally) should there be a Formula to producing great works of Architecture? I would think that a world without figurative Order & Rules of today’s contemporary Architecture (that results in the “Same” different Architecture, the same way someone dyes their hair pink or blue to be different, to be like their friends) would result in a more meaningful, natural world of Architecture filled with unique projects emulating real emotion and artfulness. When Architecture (or Music for that matter) begins to repeat these figurative patterns it also eliminates the artfulness of the unknown. The mystery of Architecture is not in the mathematics or science of Architecture but in it’s naïve soulfulness. That is where I believe the true spirit of Architecture resides.